Keynesian clowns are concerned about the decline in government jobs in the past few years. They want the government to step up spending and hire more workers to make up for the loss of jobs in the private sector. 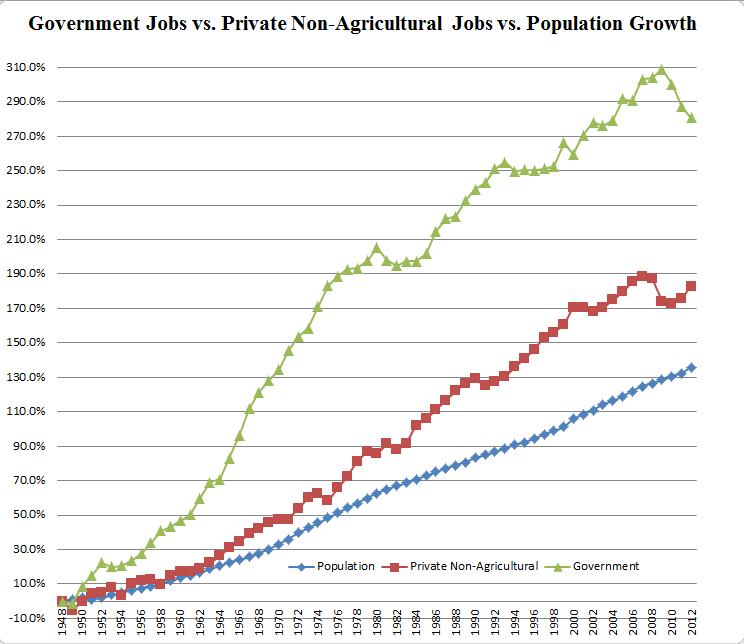 Here is a chart from reader Tim Wallace that will help put the recent loss of government jobs in a better perspective. 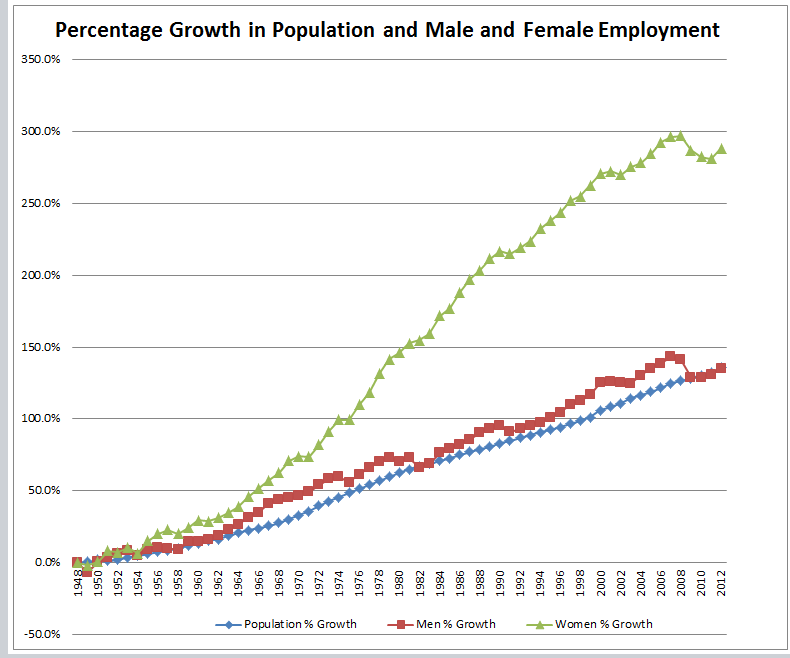 The deviance between private bobs and population growth is easily explained by the entry of women in the workforce. 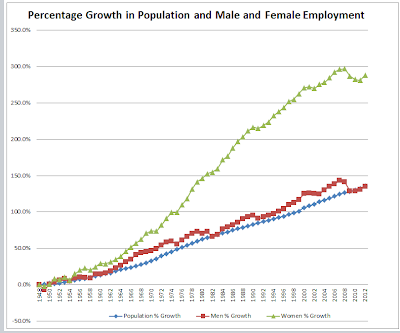 Note how the percentage growth of men in the labor force closely tracks population growth the percentage growth of women in the workforce has skyrocketed. 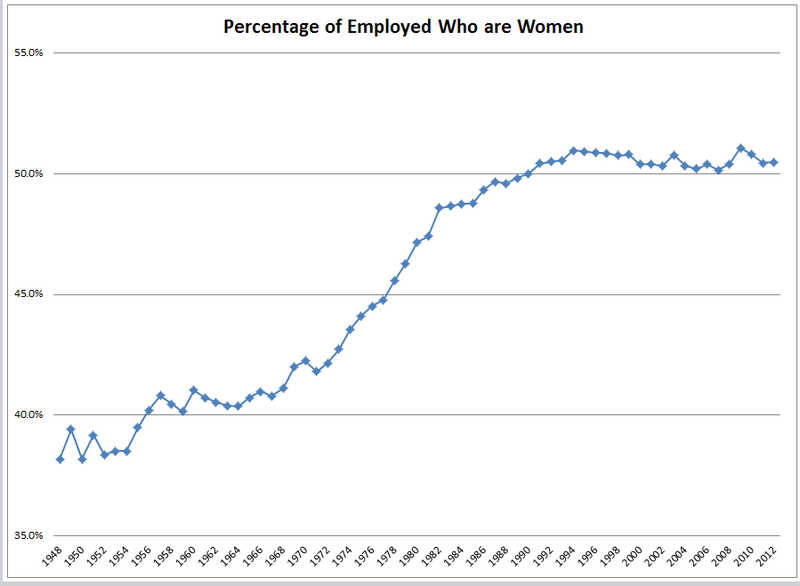 Entry of women in the workforce allowed much higher household debt levels than ever before. I'll tell you what. Ability of households to take on more debt has peaked. 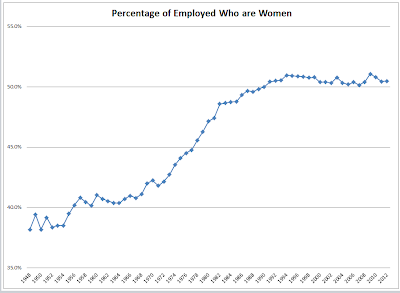 There are no more female workers to add to the pool. 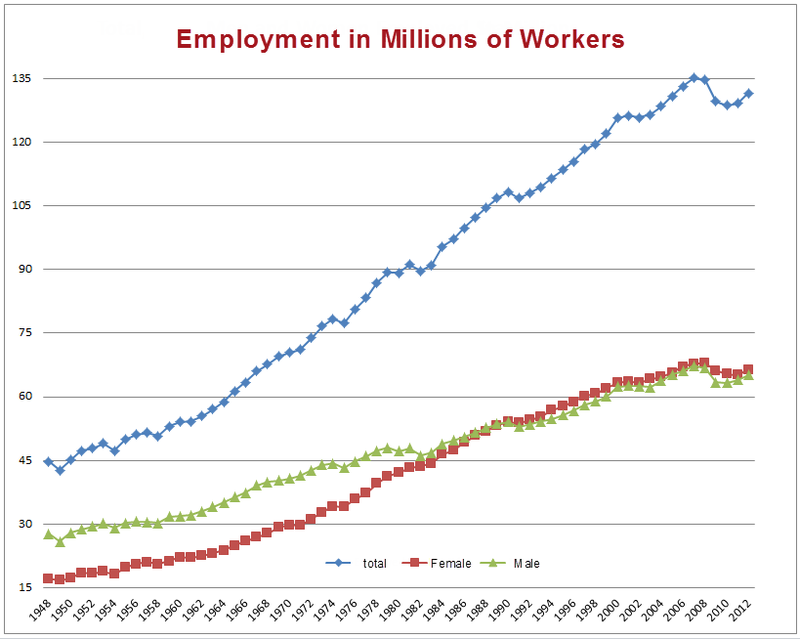 Everyone male or female is working (or is looking for work) whether they really want to or not. 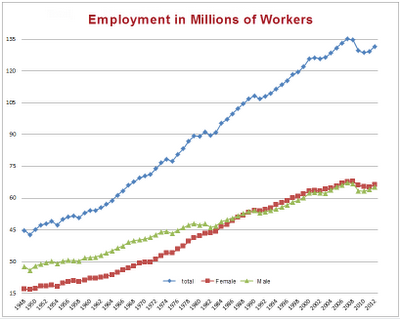 Women actually overtook men in the work force way back in 1990. The unfortunate fact of the matter is everyone needs to work to pay off accumulated debts and meet living expenses, but the jobs are not there. 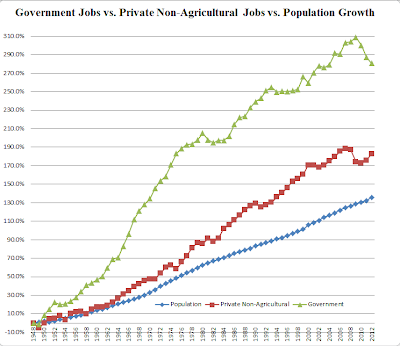 The second unfortunate fact is we cannot afford and do not need all of the existing government jobs. The third unfortunate fact is demographics are no longer favorable. Indeed, there are too few jobs, too much student debt, and too few workers supporting too many retirees on Social Security. Those unfortunate facts happen to be highly deflationary. Much pain awaits the US. Public worker pension promises have been made that cannot possibly be delivered. The US simply cannot afford to be world's policeman. Military spending must come down or it will destroy us. Medicare and Social Security problems must be addressed as well. Upcoming generations are highly likely to see a drop in standard of living vs. the baby boomers. This has never happened in US history. Just 27% think the country is heading in the right direction. I happen to agree with the majority who think those now graduating from high school will not be better off than their parents. There are too few jobs, too much student debt, and too few workers supporting too many retirees on Social Security. Who Will Address the Problems? As I look out on the political landscape, I see little hope that either Republicans or Democrats will address these problems. Republicans refuse to address the income side of the balance sheet, and Democrats refuse to address the spending side. Neither party is willing to tackle military spending. How long the market lets these can-kicking exercises continue is anyone's guess, but the longer this goes on, the more pain there will be. The culmination will be a currency crisis at some point down the road. Timing is very problematic. Japan proves debt-to-GDP ratios may go on much further than anyone thinks possible.